Out of the box, this set comes with everything you need to get started. It even comes packaged with rechargeable batteries for the mouse, and AAA batteries for the keyboard (a nice touch). Set up is pretty easy, but can be confusing if you don’t read the directions. Once the batteries are installed, the mouse has to be charged in its cradle for two hours. After that it is a matter of connecting the receiver, which is also the charging station, to a USB port on your computer. An on screen guide launches on the screen after connecting the receiver to the computer, it walks you through the steps of setting up the two pieces. However, it does not mention a crucial step of “connecting” the keyboard and mouse to the receiver. This is only in the printed directions. If you are not a directions reader, you’ll be lost and think the product is defective. Also, when connecting the device, I had to connect to a factory installed USB port, not a hub. After the connection was made, I was able to use my USB hub. You might be asking “What about installing the drivers?” I was asking myself that same thing. After reading the directions several times, searching the enclosed CD, and searching the IOGEAR website I discovered that there are no drivers for the Mac. The product only has drivers made for Windows. This is my biggest problem with this product. Do the mouse and keyboard work on the Mac? Yes. However, there is no way to customize the mouse or keyboard. The mouse has 5 buttons. Only 2 buttons (click, and control click) and the scroll wheel work on the Mac. The other three buttons are useless. The same situation goes for the keyboard. The IOGEAR website does mention that some keys will not work on the Mac. This is fine, but how about software so that Mac users can customize those keys, and others, to do what we want. The keyboard does have Mac compatible volume control, but I’d like to be able to set a key to eject my drive. How about the “Apple Key”? No keys are marked as an “Apple Key,” and there are no keys that function as one. This drove me crazy. I use the “Apple Key” all of the time for keyboard shortcuts. This was a big reason in my quickly going back to my USB Apple keyboard. With that out of the way, I’ll move on to the mouse and keyboard themselves. As wireless devices, they work great. The stated range of the wireless connectivity is six feet, and I’d say it is more like seven to eight. Responsiveness was great, too. Both the mouse and keyboard functioned like they were connected. Even at six feet away I noticed no delay in using either device. Both pieces of the set have a nice feel to them, and they look nice too. The mouse is a nice size and fits nicely into your hand. Lefties be warned- the mouse is designed for use in a right hand. The keyboard is extremely thin and had a laptop feel. It reminded me of the PowerBook keyboard. While the keyboard has lifts underneath for angling, the difference was negligible. I would have liked to be able to angle the keyboard a little higher. As I mentioned earlier, the receiver for the devices is also the charger for the mouse. Think older Palm cradles, but a different shape. While combining these two things avoids a third piece of hardware, I would prefer a USB dongle (like a thumbdrive) as the receiver. This would make portability for laptop usage a lot better. Right now this is more of a desktop product, not really something for a laptop on the go. Overall, if you are a Mac user who likes to customize your mouse and/or keyboard, or you use the “Apple Key” on a regular basis, or you want real portability in a wireless mouse and keyboard, this is not the mouse and keyboard for you. If the functionality mentioned above is not important to you, then you might want to give this set a try. Personally, I would shop around for a set with Mac specific drivers. 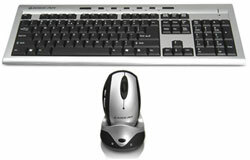 While this set does have a lot of functionality and customization for a Windows user, the parts are almost like a generic mouse and keyboard for the Mac with the wireless feature. With some programming a driver could be made to change that, and make this a really great wireless option for the Mac. However, this is a Mac oriented website, and for that reason, this gets a MyMac.com Rating of 2.5 out 5. Responsiveness is great. I noticed no delay.